Fine old zuishin dolls from the Meiji period (1868-1912), approx. 8” (20.3cm) tall. 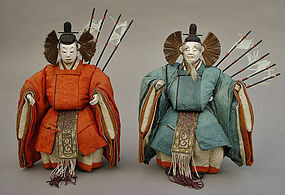 Zuishin dolls are commonly called daijin (minister) dolls; the elder man on the right (facing) is called "left daijin" and the younger man, right daijin or ya (arrows) daijin. They were created as an addition to the emperor and empress Dairi-bina sometime in the mid 18th century by Kyoto doll makers. Armed with a sword, bow and arrows, they were the toneri (zuishin) from the Heian court (794-1185). The members were usually chosen from the sons of ministers over 22 years old. Their appearance changed after the samurai (Genji) defeated the aristocats (Heike) in late 12th century and began to replace the old group. The toneri, besides being the guards and escorts, they also conducted ceremonies at the palace. Among them, there was a select group called “odoneri” (inner toneri) who were selected from the sons of higher ranking ministers. In the Kyoto area, the men in higher positions were placed on the right side (facing the dolls). In the Tokyo area, it was switched to the left. The zuishin or daijin dolls were made closely to replicate the way they were back in the Heian period by the doll maker. The black silk on the left daijin has deteriorated and revealed the liner made out of washi paper (handmade Japanese paper). Those papers, particularly the old ones are very strong (also very expensive). Some samurai’s jackets (not as liners) were even made out of washi paper. Including the umbrellas, outside sliding door, various things were made out of the washi paper. High-end dolls are still made in the same manner today although they were extremely expensive then and today – a set of hina dolls from the well known doll stores can cost well over $40,000. The paper on this doll still has not lost the texture or strength.